TweetMeHere is a very easy to use Twitter status update client. 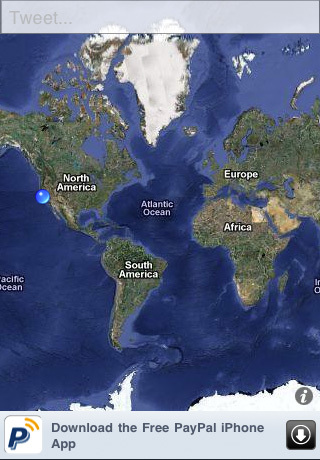 What makes TweetMeHere unique is that along with every tweet it will attach a link to your current real world location! Use it to meet up with friends, document a trip, review your favorite restaurants, the limit is your imagination. And with the powerful tools of Twitter behind your posts, the world can hear you. Simple interface - Just enter your twitter account name and password and you're ready to post. Type a message and press send and your location will be attached automatically. Automatic Message Cropping - To ensure that your location link is never lost your message will be cropped before being sent to twitter. 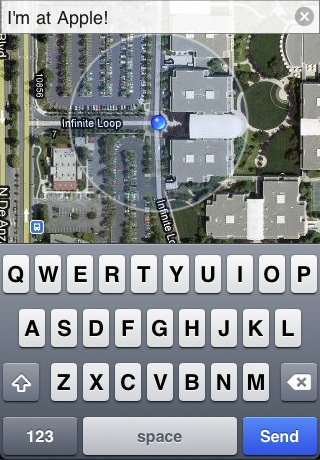 Google Power - Using your iPhone's GPS and Google maps to find and display your location is all done automatically. Please e-mail tweetmehere@toscaledesign.com with any questions, comments or suggestions regarding TweetMeHere.